The simple answer to that question, and one that saves time, is ‘now.’ Assuming you’re reading this in the summer, of course. There, you’ve now got five minutes back of your life to sort out that very shed. Chances are that we are far enough into the year for you to now realise that your existing shed is decrepit. It’s letting the whole look of the garden down with its cracked fascia and lilting demeanour. Cracked paint that cannot be restored is not shabby chic. It’s just shabby. You’ve been meaning to replace it for years. Now is the time. Your shed at this time of year is crammed with gardening guff and creaking at its rotten seams. Garden furniture is plunged into the inner murky depths of the shed as thunderclouds loom and the mower, idle for a month due to the dry weather, is pulled and rammed into the black recesses of the shed as the grass begins to grow again. It takes time to get things out, it rips and nips at your shins as you manoeuvre machines over bamboo canes, being careful not to dislodge the tray of onions trying to dry in an even manner. Potato crops are due soon, along with dahlia tubers to store. 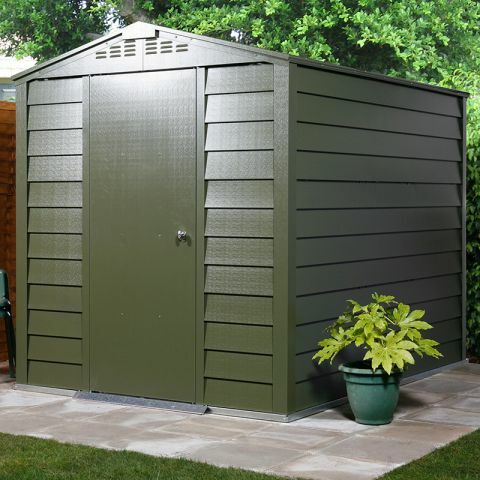 For your garden’s sake, change that shed now before it is too late. 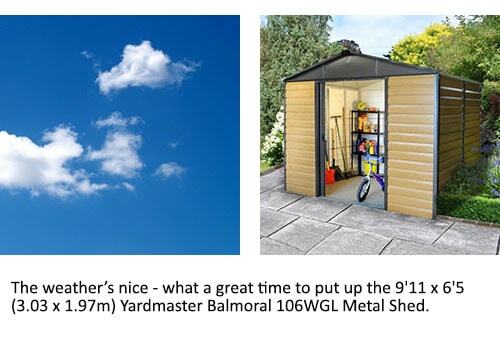 No-one wants to dismantle a shed in dismal weather. 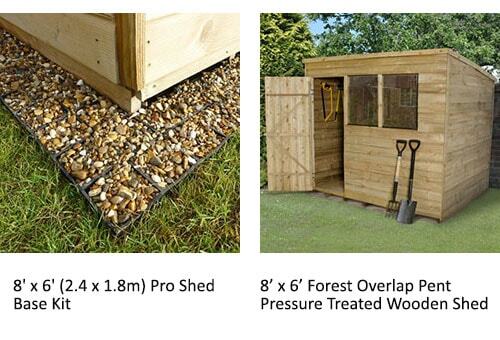 The weather now is superb and perfect for taking down your old shed and putting up the new. 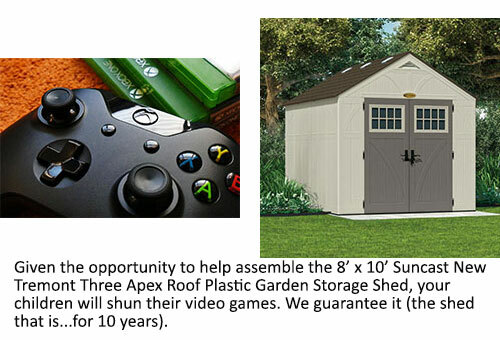 Your old shed can be offered on various websites to anyone wanting to dismantle and pick it up. Or nip down to the allotment site and ask about. Even a leaky old shed is better than nothing to a keen allotmenteer. But be warned - a shed older than five years is a tricky customer to take down. You will need two people and bags of patience. It can be done and is a highly satisfying job. The days are still long, ideal for preparing the base which can take a day or so – or try our quick and easy ProBases to save even more time. Then the big build day - hours of sunny weather to complete the job in one day. 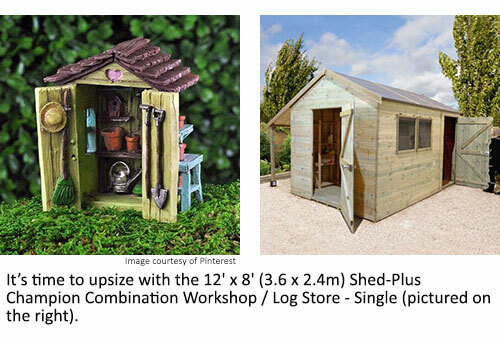 From a bare site to a fully functioning and restocked garden shed in a day, or less than a day. That's a good day’s work. Putting up a shed is always better when you have help. And now is the perfect time for that help as every schoolboy and schoolgirl around the country is surely fed up of video games and only too willing to help out for a couple of quid. Fed up? Of video games? Hmmm? There’s a summer sale on! Yep, my personal best reason to buy anything is when you can grab a bargain. 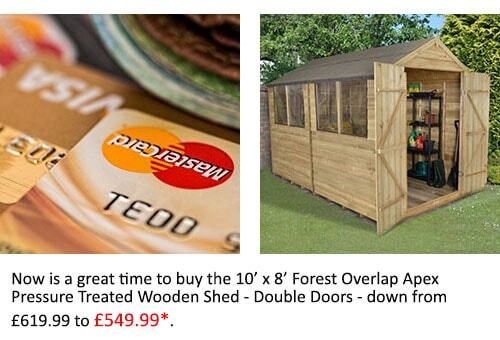 Even if the shed of your dreams isn’t in the sale (and most are - lots of shed dreams for me), you may be able to bag yourself a free padlock or something. Now that’s what I call a good reason to buy right now. So, don't delay, get your new shed ordered now before the mists and murk of autumn descend and you lose the enthusiasm and willpower to get the job done. You know it makes sense. When it comes to choosing and buying your new shed, we’re delighted to say that you’re in exactly the right place. 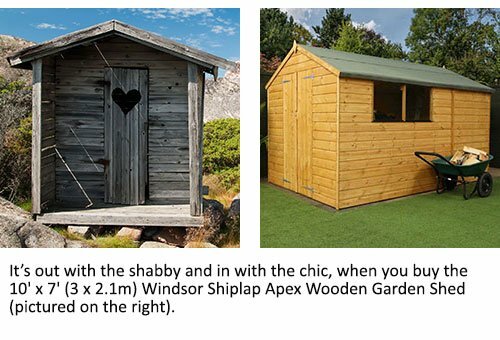 Shedstore is the UK’s premier supplier of garden sheds, so please click here to view our fantastic range of sheds for sale.